According to Greek mythology, Cancer the Crab was sent by Hera to harass and distract Hercules when he was on the Second of his Twelve Labors. Hercules was the son of Zeus and Alcmene. The ever jealous Hera, Zeus' wife, vowed to irritate Hercules throughout his life. She tricked him into a wild rage in which he killed his beloved wife and children. To purify his soul, Apollo assigned him the Twelve Labors which would each test his strength and courage. At each turn, Hera was there to make Hercules' life as wretched as she could. In the plain of Argolida there was an unhealthy marsh known as the Lerni. An enormous water snake with nine heads lived in this swamp. The Hydra was a terrible monster. One of its heads was immortal and it had breath that would kill upon contact. The Second Labor given to Hercules was to kill the Hydra. Hercules was joined by his nephew, Iolaus, as he approached the swamp. 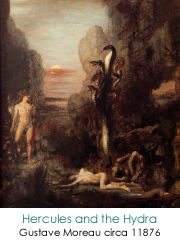 With the help of Athena, Hercules was able to find the Hydra and a major battle ensued. When Hercules would manage to cut off one of its heads, another would appear. Finally, his Iolaus brought a flaming torch and seared the neck of each head that was cut off so that another could not grow. Fearing that Hercules might indeed defeat the Hydra, Hera sent in a large crab to attack and distract him while he was fighting the Hydra. Cancer grabbed onto the hero's toe with its claws, but Hercules crushed the crab with his foot. He then cut off the Hydra's immortal head, killing it as well. Afterwards, he dipped his arrows in the Hydra's blood. It is said that even the glance of one of these arrows meant instant death. Some say that Hera placed the Crab in the heaves as a reward for sacrificing its life. Others say that Zeus put it there to honor Hercules' victory and to remind Hera of her failure. The energy of Cancer is caring and feeling. Like the awkward gait of the crab, it approaches things sideways. It wants to help and take care of us. Once attached to something, it is tenacious and never lets go. And like the crabs who live in the ocean, whose lives are spent searching the ocean floor for food, the Cancer energy is concerned with feeding us so we can grow and prosper. Our green thumbs come to life when planets spend time in the sign of Cancer. Like the tiny Hermit crabs who live along the seashore in protective shells, the Cancer energy is happiest at home, where it is safe from predators. It doesn't need elegance and finery. After all, the shell it lives in is a second hand shell, once occupied by someone else. It needs this shell to protect its soft abdominal area. And like the Hermit crab, our own stomachs can become sensitive when the sign of Cancer is too active. When planets are transiting Cancer, we want to build our nest and stay in it. We cater to our loved ones and want to make them happy and comfortable. But we can also become clingy and whiny and malign the past. We can feel sorry for ourselves too. 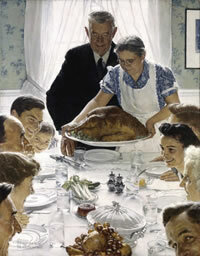 It's much better to recognize the importance of home and family during these times. We'll have our own day in the sun later. 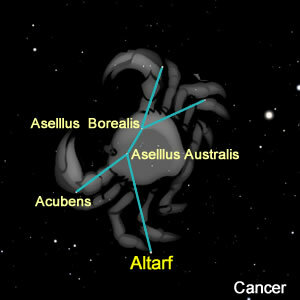 Cancer is a relatively small and dim constellation. It is best known among sky watchers as the home of the Beehive Cluster. The Beehive Cluster is also known by its Latin equivalent as Praesepe, which means hive and also means crib or manger. There are over three hundred stars in the Beehive. It is believed that over a hundred of them are brighter than our own Sun. To the naked eye, this cluster appears as a misty patch, but with the of a telescope, the many yellow and green stars of Cancer can be seen. Galileo was the first to study the stars of Cancer with a telescope. He counted over forty stars and systems in this constellation. Prior to his study, it was thought that Cancer only contained nebulae and star clusters. Cancer is the Latin word for Crab. It lies between Gemini to the west, Leo to the east, Lynx to the north, and Canis Minor and Hydra to the south. It is visible inn the Northern Hemisphere in the spring and in the Southern Hemisphere in the fall. In ancient times, the Sun passed through Cancer at the summer solstice, the time when the Sun is at its most northern point.